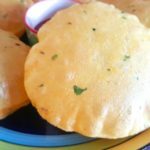 It is a shallow fried whole wheat Indian flatbread which is prepared in almost every household. Paratha is the second most popular Indian bread after chapati (Disclaimer: Not stated anywhere, just that I believe so.) 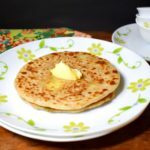 Plain paratha recipe makes a great accompaniment to most of the Indian gravies, dal, dry sabzi, etc. 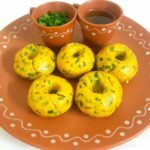 Especially if the menu has some any or dal which is not your favorite, you can pep up the whole meal by serving it with some parathas. 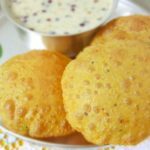 This particular recipe is very easy, simple and quick to make. It is absolutely fuss-free and therefore can be tried by amateur cooks, bachelors, etc. Whole wheat dough is used to make parathas. It should be softer than the dough for chapatis. Further, it is important to rest the dough for sometime before rolling into parathas. Keeping these parathas a bit light I have not applied any oil or ghee inside the parathas. I like to use oil to fry the parathas. You can use ghee too. These parathas don’t take long to cook since there is no layering etc. These should be cooked on medium flame till golden brown patches on both sides. Finally, these can be greased with some ghee/butter. 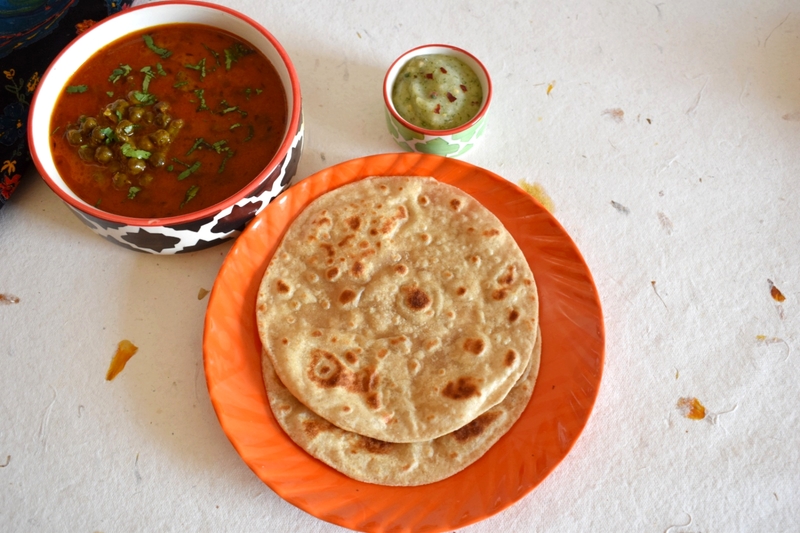 Another paratha that works great with gravies etc is masala paratha. View the recipe here. 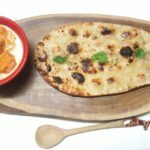 You can also check out our collection of paratha recipes. Here it is. Serve plain paratha with hare chane ki sabji or kale chane ki sabji for a weekday lunch. 1. Take a portion of dough, almost 1 and ½ times that of chapati. Roll it and flatten it. Cover with some whole wheat flour. Place it on the rolling board. 2. Roll it, bigger and thicker than a chapati but not too thick. Meanwhile heat a skillet or pan. 3. Put the rolled paratha on the hot skillet. 4. Cook till partly cooked from one side. Flip and apply little oil, ½ a tsp. 5. Again flip and apply little oil on the other side too. 7. Grease with ghee or butter. 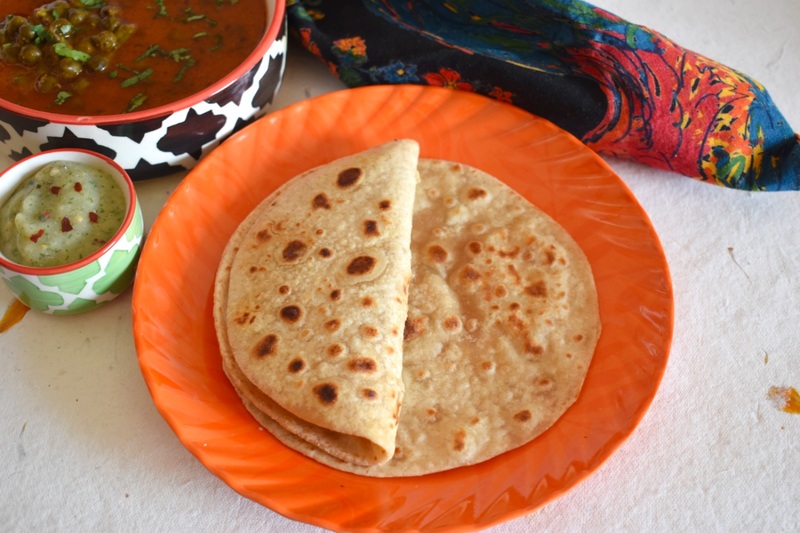 Take a portion of dough, almost 1 and ½ times that of chapati. Roll it and flatten it. Cover with some whole wheat flour. Place it on the rolling board. Roll it, bigger and thicker than a chapati but not too thick. Meanwhile heat a skillet or pan. Put the rolled paratha on the hot skillet. Cook till partly cooked from one side. Flip and apply little oil, ½ a tsp. Again flip and apply little oil on the other side too. Grease with ghee or butter.